In January 2012, I was giving a keynote address on becoming a ‘Challenger’ to a room full of highly competent sales reps, who were self-described as Relationship Builders in their selling approach. In fact, this approach was reinforced by the whole organization as it had been centered around relationship building for more than three decades. To create an impetus for changing what had been endorsed as the preferred selling approach (a.k.a., status quo) for decades, I had to create a constructive tension in a visually compelling way. This post is aimed at showing how I did so in a way that resonated with 5 different sales teams that didn’t know this was a problem. As aforementioned, the 5 various team types (i.e., B2B, B2C, B2I, 501(c)(3), and licensing/franchise sales), were comprised of highly competent professionals. Most of the team had tenure between 5-20 years and knew their customers, their issues and aspects about how the products, services and solutions would benefit customers more significantly than any competitive offering. Due to a very unique, well-defined marketplace that is not very large, the relationships that had been formed over many years with customers were very strong. From the customer’s point of view, the reps were highly regarded. Furthermore, these reps were instrumental in taking market share from competitors year after year. After a deep dive into the metrics, processes and behaviors, I saw an opportunity to go from good to great, especially after identifying that the intentional behaviors were not leading to predictable and repeatable results. As a side note, whenever I see leaders and/or teams that don’t have these 3 characteristics (intentionality, predictability and repeatability) in their performance, I see risk and ripe opportunities. Additionally, having worked years ago with a 100 year-old company who mistakenly believed that relationships were key to their successful sales, I saw this as the Achilles heel, that not only would bite them, but already had some overlooked signs of performance drains. When it comes to the Relationship Builder, statistically, this sales profile has the lowest probability of success for becoming high performers, particularly in a higher complexity sales environment. 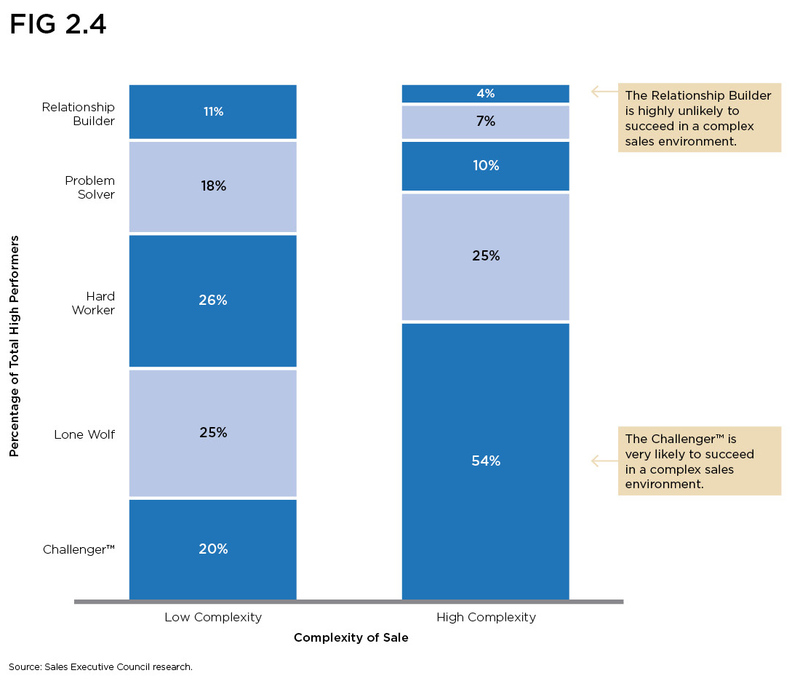 According to the Sales Executive Council’s research, only 4% of Relationship Builder’s are likely to be high performers in a complex sales environment, whereas the Challenger profile, at 54%, was very likely to succeed in a complex sales environment. (See Fig. 2.4 from the SEC below). As with any change effort, it is never just one thing. There are many aspects to leading a successful change effort, much of which is not described in this post. That said, I wanted to share of one specific and practical way to illustrate your point in an experiential and visual way. With the data shown above in Fig. 2.4, and my diagnosis of where these teams stood to make transformational improvements in their performance, I did the following. I made a life-size bar chart on the stage as the backdrop for my keynote address. I used stacks of the company’s products to make the representative bars for each respective sales type (i.e., One stack for the Relationship Builder, one for the Problem Solver, and so on for the Hard Worker, Lone Wolf and Challenger). Each product represented 5% within the stacked bar . I took the organization’s most iconic product, which measured approximately 14 inches high in its package, and made the graph with the Relationship Builder profile at 4% on one end and the Challenger profile at 54% on the other end. The stark contrast between the two ends of the life-sized bar chart not only was visually stunning, but resonated with each of the reps who recognized the gaps between what had been and what should be for them. Many leaders wait until they see problems before they initiate a change effort. How about you? If so, do you know what to do about it? Are you challenging the status quo? Does your team know which behaviors to be intentional about that lead to predictable, repeatable results? An answer of “No” to any of the questions above can have dire consequences if not addressed. If that describes you, seek out a trusted resource, colleague or other business professional with a solid track record of improving performance in these areas. If you would like to receive other insights on The Challenger Sale and how to get intentional, predictable, repeatable results from your team, follow my blog. That would have been a stunning video to create. Not just the construction, but the look on people’s faces and the exit interview aftermath. Wonderful use of imagery. Thanks for sharing. Absolutely brilliant. Nothing beats visual aids. One time, long, long ago (believe it or not it was pre PowerPoint days!) 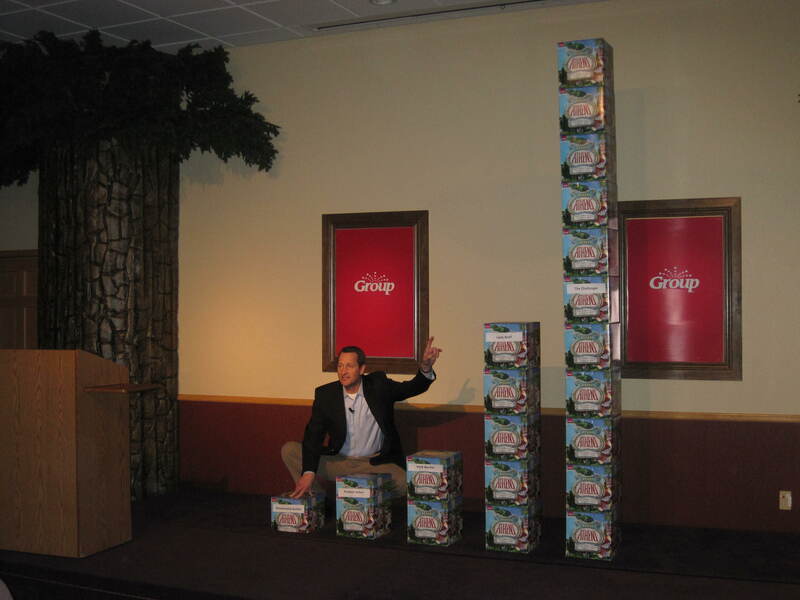 I brought a stack of bright, white porcelain toilets on stage to show a group of builder’s merchants how many toilets they had to sell to return the same amount to their bottom line as the product I was proposing to them would save each year. That Fortune 500 company turned into my biggest customer for the next 10 years! I too will be following you. Thanks for your comments, Tom. I am honored. What a great example you provided as well with the Fortune 500 company. I would have loved to see that in person as that really brings the point home. Well done, and thanks again for weighing in. Jeff, I am a fan of using visuals…message goes straight to the visual center of the brain and makes a memorable impact! Excellent and innovative! 10 Points!!! @Victor – Indeed it does, when using visuals. Thanks for your comments.